Looking for budget-friendly rates on all cartridges? To get fabulous bargains, and more, purchase your cartridges at Cartridge Save, the leading specialist within the UK. Cartridge Save specialise in the provision of just discount Lexmark Z615 ink whilst ensuring you enjoy our fantastic customer service. Searching for half a day just for the least costly printer cartridges is nothing but an utterly boring time sink. You can stop wasting hours comparing who is advertising the best deals - all of the cheapest deals are be found on our website. Start saving your cash and free time, order at Cartridge Save now! You can get peace of mind when you place an order from us thanks to the cast iron thirty day money back guarantee. Should you experience difficulties with your cartridge inside thirty days after purchase you can easily mail it to us for a 100% refund. And of course, everything features completely free overnight delivery! There are so many different options out there where printers are concerned that it can get a little hazy deciding which brand is right for you, never mind which specific model. The Lexmark name is one which you might not be overly familiar with and as a result, the Lexmark Z615 is a model which might not have ever made itself known to you. But there are many good things to be said about this printer. Here is a brief review of all the finer features of the Lexmark Z615. The Lexmark Z615 is a very nicely put together piece of equipment. In many ways, the subtle nature of a printer is often its most endearing feature and the Lexmark Z615 is certainly subtle. A soft, understated grey finish is complimented by soft curves and an unassuming print tray and feed element, making the Lexmark Z615 a simple and yet attractive piece of equipment. The key advantages of any printer can be judged in the quality of the print outs it creates. Thankfully, the Lexmark Z615 lives up to the hype in this department. In many ways, the Lexmark Z615 is one of the best printers on the market where value for money is concerned because even though this is an affordable item, the quality of results is very high indeed. 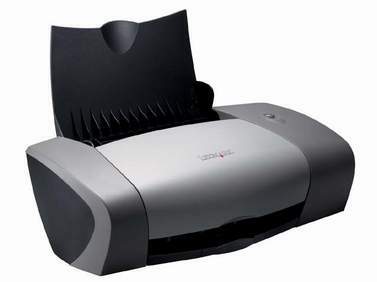 Of course, any printer which is labelled as being affordable will have limitations and where Hewlett-Packard Photosmart items boast a range of further features, the Lexmark Z615 is actually rather simplistic. Still, it does exactly what it says on the box. The Lexmark Z615 prints, and it does so very well indeed.